On the second-ever World Preeclampsia Day, May 22, 2018, maternal health advocates, donors and champions gathered at the Wilson Center for “Non-Communicable Diseases: Pre-eclampsia Risk Factors and Long Term Complications.” Panelists focused on neglected areas of pre-eclampsia care and discussed their work and research in chronic heart and kidney diseases, diabetes and obesity, and challenges in detection, management, and treatment in high- and low-resource settings. The Ending Eclampsia project also shared preliminary findings from research in Nigeria and Bangladesh and called for efforts to focus on research initiatives that aim to eliminate gaps in coverage for PE/E and related morbidities and scale up of best practices. 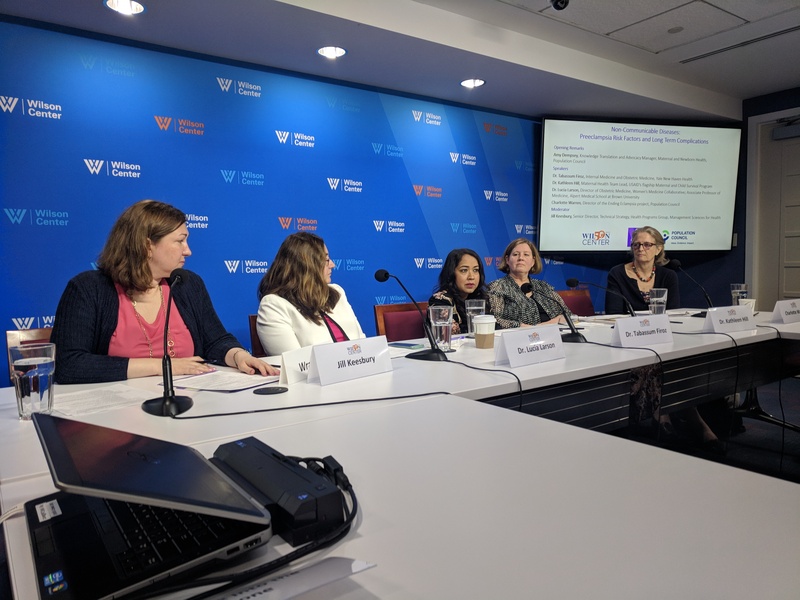 If you missed the event, watch the webcast on the Wilson Center’s event page and read “Every 11 Minutes: Hypertensive Disorders in Pregnancy are Deadly (And Have Long Term Complications for Mothers and Children).